CLEAN CARFAX, BLUETOOTH, MP3/CD PLAYER, ALLOY WHEELS ABS brakes, Electronic Stability Control, Illuminated entry, Low tire pressure warning, Remote keyless entry, Traction control. Clean CARFAX. 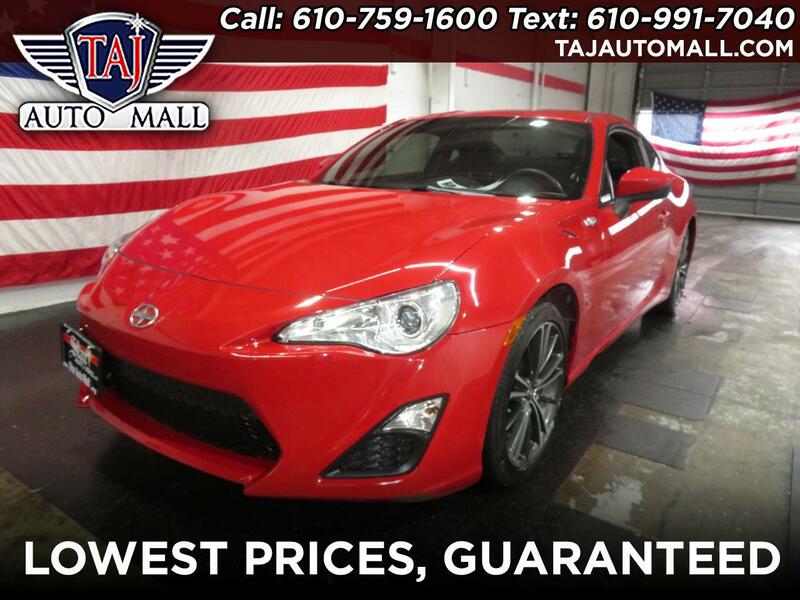 Red 2014 Scion FR-S RWD D-4S 2.0L H4 DOHC Recent Arrival! 25/34 City/Highway MPG Reviews: * Light and well-balanced chassis; excellent steering; impressive fuel economy; comfortable front seats. Source: Edmunds * If you're all about driving dynamics, rowing your own gears and putting your skills behind the wheel to the test, there is no better car to prove yourself in than the 2014 Scion FR-S. Source: KBB.com * The 2014 Scion FR-S is a next generation driving machine available for your exhilaration today. A clean sheet design, this sport coupe combines accessible power with a sublime chassis to deliver pure driving delight. It's quick steering and low curb weight will help you dance through twisty corners. The FR-S is powered by a 2.0-liter horizontally opposed 4-cylinder boxer engine cranking out 200 horsepower at 7,000 RPM and delivering 151 lb.-ft of torque at 6,600 RPM. The front-mounted flat boxer engine drives the rear wheels through either a 6-speed manual transmission or an optional 6-speed automatic with paddle shifters. With design features like a sporty leather-trimmed steering wheel and optimally placed shifter, your hands will take control of the FR-S with intuitive fluidity. And with sport-design instrumentation, you will immediately get the information you need most. Plus, when deep in the corners, you will be glad the FR-S comes standard with its incredibly supportive front seats. Plus for 2014, for extra comfort, knee pads have been added to the center console and the doors. The FR-S offers 6.9 Cubic Feet of cargo volume, with the rear seats up. However, they fold flat to give you extra space when needed. Other standard features include a remote keyless entry system, analog tachometer with programmable rev indicator, a multi-information display, and conveniently placed metal sport pedals. New for 2014, the Pioneer Standard Display Audio System gives you great sound and a 6.1-inch touchscreen. However, for the audiophile who needs perfect music you can upgrade to the available 340-watt Pioneer BeSpoke Premium audio system. It has a 5.8-inch touch screen, navigation, and Zypr, a feature that lets you use voice commands to access iPhone app functionality. For safety the FR-S comes equipped with anti-lock brakes, traction control, brake assist, and vehicle stability control. Drive the 2014 Scion FR-S today! Source: The Manufacturer Summary Taj Auto Mall has over 1,500 affordable vehicles in stock. Our dealership specializes in providing you with the best used cars, trucks, and SUVs in the Allentown, Pennsylvania area. Part of our promise to you is that we will always strive to provide you with unbeatable service. Our goal is to go above and beyond your expectations. Our Bethlehem dealership has tons of well-equipped SUVs, trucks, and cars at highly affordable prices. Recent Arrival! So come on down to our dealership in Bethlehem, Pennsylvania. We are open Monday through Saturday from 9 am to 8 pm. Contact us with any used car questions you may have, our number is 610-759-1600. Make Taj Auto Mall your first choice for affordable used vehicles. Message: Thought you might be interested in this 2014 Scion FR-S.